Made from stuff you have on hand! I don't know about you, but sometimes I get myself into a bind where I need a quick little "something" to take to a brunch or to a friend's house. This is the perfect recipe for such an emergency, because it's made entirely of ingredients found in any pantry. These little muffins also freeze well - just thaw out as many as you need, and keep the rest on hand for later. Butter 2 mini-muffin tins (24 muffins in all.) In a mixer, cream Crisco and ½ cup sugar together. Add egg. Sift flour, baking powder, salt and nutmeg together and add to mixture. Pour in milk and mix until smooth. Put a heaping teaspoon of batter in each muffin tin. Bake at 350 degrees for 10-12 minutes (muffins will only be lightly brown.) Dump them out and allow them to cool just slightly. Stir 1 C Sugar and the Cinnamon together in a Ziploc bag. Dip each muffin in melted butter and then toss in the sugar/cinnamon mixture. 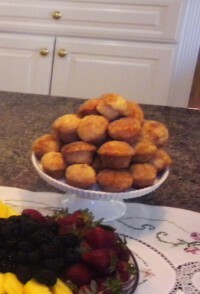 Search for Breads articles similar to "Mini Cinnamon Muffins. Search all articles similar to "Mini Cinnamon Muffins".